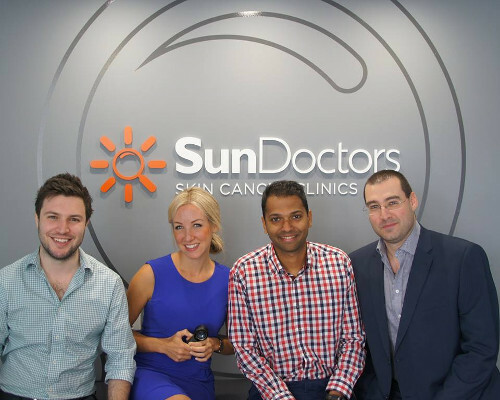 Community Corner - Featured Local Business: SunDoctors Skin Cancer Clinics. Thank-you to all our customers for your support throughout the year, we look forward to seeing you again throughout the Christmas season and into 2017. • Remember to organize your newspaper delivery stops and starts by visiting us in-store or online at www.pattersonroad.com.au. • Publisher subscription customers are reminded to contact the publisher directly to arrange all delivery stops and starts. 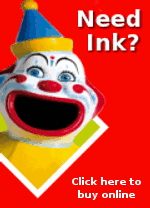 • Patterson Road Tatts News & Post is open from 9-00 am to 12-00 midday on public holidays except Christmas Day & New Years Day. • There are no newspapers published on Christmas Day. 7-00am to 6-30pm Saturday and 9-00am to 12-00md Sunday and public holidays except Christmas Day & New Years Day. 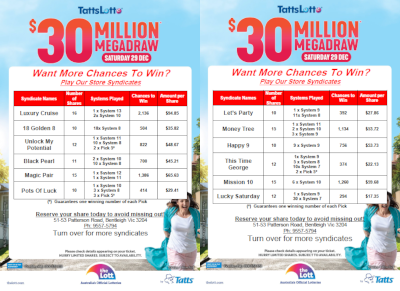 Select any combination of Tatts Instant Scratch-Its and other Tatts games including entries for the $31 Million TattsLotto New Years Eve Megadraw, on Saturday 31st December, for your Tatts Christmas Gift Packs. 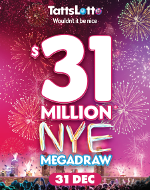 Megadraw syndicates and advanced entries are now available for the $31 Million TattsLotto New Years Eve Megadraw on Saturday 31st December. Call in today and pick up your ticket to dream or contact us to reserve your syndicate shares. SunDoctors, a recent addition to Patterson Village, at 116 Patterson Road have extended their introductory offers for our community until 31st December 2016. 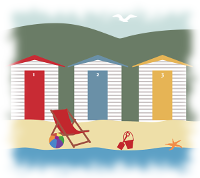 SKIN CANCER CHECK- BOOK NOW! Did you know that 2 in 3 Australians will get a skin cancer by the age of 70? So why not give your loved one a Christmas present that will not cost you anything but could save their life......a SKIN CANCER CHECK. 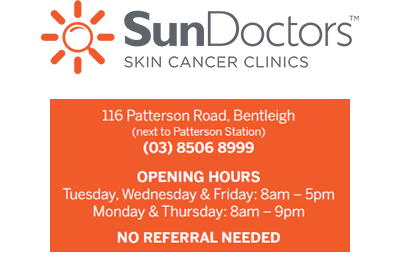 Until December 31st 2016, SunDoctors Bentleigh is bulk billing initial consultations - including all tests and treatments during that consultation. Call us, book online www.sundoctors.com.au or drop in to make an appointment with our friendly reception staff…..or just for a chat! Terms and conditions apply, visit www.sundoctors.com.au or call 8506 8999 for more information.